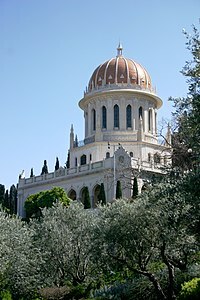 Shrine of the Báb in Haifa, Israel. Siyyid `Alí Muḥammad (20 October 1819 – 9 July 1850) was a merchant from Shíráz, Iran who started a version of Shia Islam called Bábism. After he started the religion, he changed his name to Báb. People who believe in the Báb are called Bábís, and they believe that the Báb was a prophet. Bábís also believe that the Báb is the Qá'im that Shi'as believe will come in the future. The Báb wrote hundreds of letters and books teaching who he was and what the rules of his religion were. The Báb's new rules replaced the "Sharia law" or Muslim rules for his followers. Bábism became very large; over ten thousand people believed in the Báb. The Shi'a clergy, or leaders of Islam in Iran hated the Báb and tried to harm people who followed his religion. In 1850 a firing squad shot the Báb in Tabríz, Iran. The Báb had other names, for example the "Primal Point" and the "Point of the Bayán." The Báb told everyone that another prophet who was stronger and even more powerful was coming soon. People who follow the Bahá'í religion believe the Báb was talking about Bahá'u'lláh, who started the Bahá'í religion. The Báb was born on October 20, 1819, in Shiraz, Iran. His father was a merchant, and many people in the town knew him. Very soon after the Báb was born, his father died. The Báb's uncle Ḥájí Mírzá Siyyid `Alí was also a merchant, and he raised the Báb. When the Báb became an adult, he started working as a merchant with his uncle. In 1842 he married a woman named Khadíjih-Bagum. Together they had one son, who they named Aḥmad. Aḥmad was very sick and died when as a baby. Someone who lived at the same time as the Báb said he was very calm and quiet; they said the Báb only spoke who he had too, and did not even answer questions. The Báb was always thinking and praying. People said he was handsome, and had a thin beard. He always dressed in clean clothes, and wore a green scarf and a black turban, or wrap of cloth on his head. Shaykh Ahmad-i-Ahsa'i started a Shi'a Islam religious group in Persia in the 1790s. The member of the group, who were called Shaykhis, believes that god was sending a new messenger to earth very soon. They called the new messenger the Qá'im, or theMahdi. When Shaykh Ahmad died, Siyyid Kázim, who was from Rasht, Iran, became the new leader of the Shaykhis. Shaykh Ahmad lived was born in 1753 and he died in 1862. Siyyid Kázim was born in 1793 and he died in 1843. When the Báb went on a pilgrimage to Karbala and the places near it, he may have listened to Siyyid Kázim teach. Nobody knows for sure if he did or did not, because there are very few documents or records from that time. When Siyyid Kázim was dying, in December, he told all his followers—people who believe what he taught—that they should travel and try to find the new prophet from god. He called that prophet "The Lord of the Age", and told them that he would be discovered very soon. One of the people who believed Siyyid Kázim prayed and fasted, or stopped eating from dawn to dusk for forty days - his name was Mullá Ḥusayn. After that he travelled to Shiraz, and he met the Báb. Mullá Ḥusayn got to Shiraz on May 23, 1844. A young man wearing a green turban greeted him after he had not been in Shiraz for very long. In Iran at that time, only people who were related to the prophet Muḥammad wore green turbans. Men who were related to the prophet Muḥammad were called Siyyids. The young man was the Báb, and he invited Mullá Ḥusayn to his home. The Báb asked Mullá Ḥusayn why he was in Shiraz, and Mullá Ḥusayn told him that he was searching for the new prophet, or Promised One. The Báb asked Mullá Ḥusayn how he would know who the prophet way. Mullá Ḥusayn told him that the prophet would come from a famous and good family, and would know many things without having to learn them, also that he would have no problems with his body. Then the Báb said that all of those things were true about himself. "Behold, all these signs are manifest in me." The Báb was saying that he was the new prophet Mullá Ḥusayn had been looking for. This shocked, or startled Mullá Ḥusayn. Mullá Ḥusayn was the Báb's first disciple. A student of a religious leader is called a disciple. In less than five months, seventeen more students of Siyyid Káẓim became disciples of the Báb. All of the new disciples started believing the Báb was a new manifestation, or prophet of god without anyone else's help. One of these new disciples was a woman. Her name was Zarrín Táj Baragháni, and she was a poet. Later she was given a new name,Ṭáhirih (the pure). Later people started calling the first eighteen disciples and the Báb the Letters of the Living. The Báb told the Letters of the Living that it was their job to tell people that he was the new prophet. The Báb said that the Letters of the Living were special. In Shi'a Islam there are fourteen special people, called the "Infallibles". Shi'as believe the "Infallibles" are always right. Muhammad, the twelve Imáms, and Fatimah, are the "Infallibles" in Shi'a Islam. Just like the "Infallibles", one of the letters of the Living was a woman, and one was a prophet. Nineteen was a special number in Bábism. The Letters of the Living were very much like the Twelve Apostles of Christ. ↑ 2.0 2.1 MacEoin, Dennis (1989). "Bāb, Sayyed `Ali Mohammad Sirazi". Encyclopædia Iranica. ↑ Hajji Muhammad Husayn, quoted in Abbas Amanat, Resurrection and Renewal: The making of the Babi Movement in Iran, 1844-1850 (Ithaca: Cornell Univ. Press, 1989), 132-33. ↑ 4.0 4.1 Nabíl-i-A`zam, The Dawn-breakers, p. 57-58. ↑ Nabíl-i-A`zam, The Dawn-breakers, p. 65. ↑ "The Time of the Báb". BBC. Retrieved 2006-07-02. This page was last changed on 5 April 2019, at 20:00.